When I was in my late 30’s, I finally got around to reading Dale Carnegie’s classic How to Win Friends and Influence People. I’m not saying it’s rocket science and that everyone should order a copy from Amazon ASAP. Well, maybe I am saying that…at least the last part of the sentence. Rocket science is rocket science, but Mr. Carnegie’s book is the go-to book for getting along with others, maximizing success, and developing relationships. Its theme is based on fundamental principles of fairness, kindness, courtesy, civility, and good old-fashioned common sense. I’m glad I read it. Like Voltaire said, “Common sense is not so common,” and I needed a few reminders. I didn’t intend to write a book review. It’s just that I was thinking of the influence that book had on me at an earlier time of my life. I need to go back and reread parts of it, and I think everyone alive could benefit from doing the same thing. By the way, an up-to-date version, How to Win Friends and Influence People in the Digital Age, is now available, but the reviews aren’t that positive. Most of the ones I skimmed advised the reader to stick to the original edition. But here’s my story. This weekend, I’ll be attending my 50th high school reunion (gulp), and I’ve been reflecting on other reunions. While they’ve all been fun, I recall the 20th with most affection, and I think it’s because my former classmates all seemed to be practicing the concepts of Mr. Carnegie’s book. I first read the book because I was teaching Human Relations, PSY 103, and was always on the prowl for a little something extra to spice up my classes. As years passed, I was happy to see that some (much?) of Carnegie’s work fits in nicely with cognitive psychology and the importance of one’s thoughts. I’m going out on a limb and professing that his tried and proven methods of friendly, sane, and measured behaviors are in line with Goleman’s ideas about emotional intelligence. There are definitely some similarities although Goleman’s work is research-based. Question: Is there anything new under the sun? I hope everyone who attends this weekend’s activities feels acceptance, interest, and inclusion from his and her classmates. If you’re a sister or brother graduate, you can be sure I’m going to greet you with a smile, mention your name, ask about your life, and listen attentively while you tell me…not because I’m a manipulator but because it’s the human thing to do. So tell me. What have you been up to since we last met? I went to a beautiful backyard wedding last night, Carol and Randy’s. On the way home, we talked about what made the event especially nice, and we finally decided that it was EVERYTHING. From the setting to the music and food and special combination of people, we loved it. Oh, and then there’s the fact that love was involved; that always adds the icing on the cake (quite a cliché, but still true). It rained all the way to Sumter, and the closer we got to the house, the heavier the showers became. When we arrived, the bride’s son-in-law was standing barefoot in the drive, umbrella overhead, directing guests back to their cars to wait it out. The family had been closely watching the weather reports, and all were confident that the storm would pass by 5:00. Sure enough, the downpour turned to a light sprinkle, and by the time we made it to the backyard, we put our umbrellas away. I loved the symbolism of the cleansing rain followed by the life-giving sun. Vows complete, Carol’s brother, a minister who had conducted the service, pronounced them husband and wife, and everyone clapped. As the afternoon and evening progressed, people chatted, danced to the DJ’s selections (each carefully selected by Carol and Randy), reunited with old friends, ate scrumptious barbeque and the fixin’s, shared stories, and laughed a lot. Everyone was happy for the couple and grateful for love, sweet love. I met a couple who met (or re-met?) at their 15th high school reunion a few decades ago and married not quite two months later. We chatted briefly about the importance of timing, but before I could hear more about their romance, my hubby snagged me to go to the drink table with him. I must share this. While we were eating, Nancy, a friend and techno-savvy person, came to our table and asked each couple for advice to give Carol and Randy. It was impromptu, but I think we did “okay” in our brief videotaping segments. Rex and Patricia advice was to remember that each of them loved the other more than anyone else in the world. In their case, whenever either of them gets perturbed, they think, “No one loves me more than Patrica (or Rex),” and that thought quells acrimony or annoyance. Patricia went on to say that although he doesn’t drink coffee, Rex gets up every morning and fixes it for her. One day when he didn’t have time to prepare it (can’t remember the reason), he went to Baker’s Sweets, a local eatery and coffee shop, and bought her a cup. That’s love. The rest of us gave some pretty good advice too, but I don’t have time to write about it now. Maybe later. People drank peach tea and wine, ate fruit and wedding cookies, and savored barbeque and rice. They thought about love and families and connections. “The sun comes up and seasons change, but though it all, love remains.” A good time was had by all, and I hope the Brileys have a long and happy life together. Havlan says that a writer should always look beyond the facts. What’s important are the emotions and the feelings beneath the facts and not the facts themselves. ASK: What does this piece of writing mean? What does the story mean to you? What’s the reason you’re writing about it? Make it about something. Otherwise, why bring it up? I’ve been writing a chronicle of our three days in the mountains that happened a couple of weeks ago but why? Do I have aspirations of becoming a travel writer? Not at all. Then why? Time is fleeting and we need to just do it. It’s a big beautiful world out there and yet too often we stay securely in our own narrow little worlds. Also, traveling is a huge memory-making thing. I’ve known my fellow travelers all of their lives, and now we have some extra special memories outside of our regular environment. When’s the last time you rode with someone on a chair lift up and down the side of a mountain, sang in a diner at 10:30 at night, or laughed so much that your stomach hurt? Back to my story. Since this was our third and final day of our mountain Girls’ Trip, we wanted to make hay while the sun shone. Up early, we packed the car, checked out, and headed towards the downtown area. 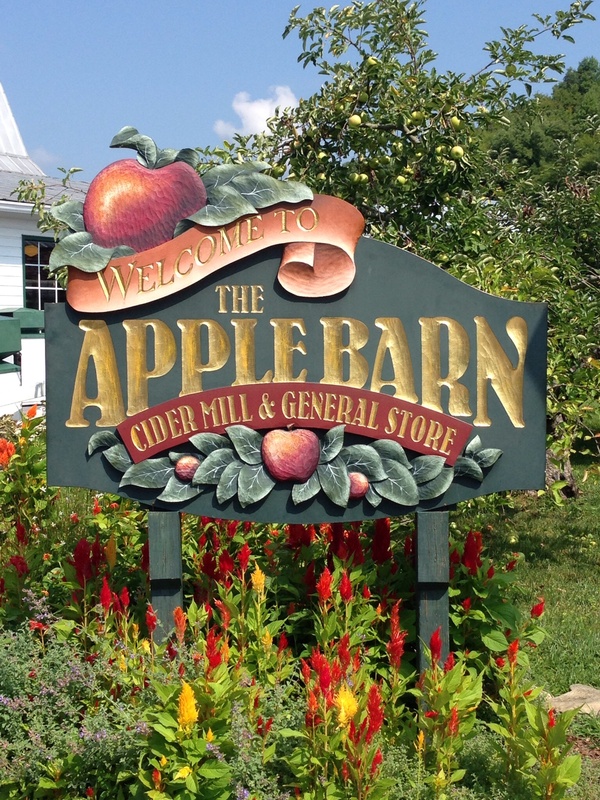 By now everyone had done something on her bucket list except for my niece, and Katherine really wanted to visit the Apple Barn in Sevierville. I’m so glad we stopped there. There are a number of enticing shops where one could buy food, wine, and all manner of apple-related products. Lunch was nice, and although the meal itself was tasty, I have to admit that I most enjoyed the fruit julep and the soup. We took turns taking pictures with fellow travelers. Cars careened off of the road onto the overlooks and people sprang out of the car for a quick look and photo op before heading off to continue their mountain adventure. Most of the time, they volunteered to take our picture if we would agree to reciprocate, but sometimes one of us approached them first. Our favorite group was a couple with a young child who stopped for the sole purpose of taking our picture. From about an hour away, they said they made the trip every month or two and gave us some tips for our next visit. We survived the parking nightmare at Tanger, a shopping mecca so crowded that traffic cops were there to direct traffic, both automobile and pedestrian. We found a Bible that had been left at a church in Cades Cove; the owner had written a special passage about his fervent desire to marry someone and his concern over whether she would say yes. We tasted fried pickles, ate the most decadent chocolate brownies ever, and shared a huge banana split to honor my other daughter’s 39th birthday. I watched an adorable Chinese child crumble her saltines in a small plate and eat them with a spoon. I learned that my sister wants to change the spelling of her name to Ayan and that my niece has developed an interesting accent. According to her mom, Katherine now adds an “a” to the end of many of her words, and soon we were all doing it. The story beneath these facts is that road trips are worth every dime and every minute of time that you spend. I know without a doubt that there are three other South Carolina gals who are still singing Mickey’s “Hot dog, hot dog, hot diggidy dog” and remembering one last hurrah before heading back to school. Nothing big or major here. Just a few observations on life. I’m at the beach for a few days and have relished every moment of my time here thus far. Despite being overly fatigued, my daughters and grandchildren have added much joy to my life. Here are some thoughts, not too deep but worth considering. On the way to the coast, I stopped in Conway to visit with an old and dear friend. One of the many things I’ve always loved about her is her ability to hear about a situation and assess it “spot on” without all of the emotional fringe stuff. Then too there’s the fact that she’s wise, spiritual, philosophical, and practical. If that sounds like an interesting combination, well yes, that’s what makes her so special. Before we had our conversation, I turned the corner (more like a soft curve) and spotted two women walking down the middle of the tree-lined street, and I recognized them as my friend and her expectant daughter. Immediately I recalled a moment that happened 35 (?) years ago when I saw her cross Main Street from Ninth Avenue cradling this same daughter in her arms. Catherine was a baby, and her mom was taking her to daycare before work. Those were the days—the crazy days of childcare and working that somehow we managed to get through. Decades later there were two blond, beautiful women ambling down a Conway street, one expecting a baby in less than two weeks. So in a sense, I was walking behind three generations although I couldn’t see the tiny one’s face or form – yet. Plus, they were in Conway. Conway. A city with a lot of history for these two and many, many others. You could almost sense the spirits of their ancestors hovering about. Early the next morning my daughters and grandchildren were up and about making preparations for a couple of hours on the strand. I was in beach attire, and Colton, the little five-year-old kept playing (best word here) with my upper arms. “Why does your skin shake like this, Grandmama?” he asked as he flicked it back and forth. Ah, the challenges of getting older. It’s neither fun nor attractive to have flabby arms, but what are my choices? Some people have surgery, but then there are scars to deal with. Plus, there may be more limited use of movement and strength. My intention right now is to keep them covered and focus on the wonderful things my arms have allowed (still allow). For starters, hugging people. I love that. Also driving my car, picking up things, and chalk painting furniture. I started to say “typing,” but I know there are people out there who might remind me of stronger souls than I who have learned to type holding a pencil in their mouths. That same day I went for a walk on the beach, and four older ladies (75?) stopped me and asked me to take their picture. Happily, I complied. I snapped about four pictures, and hopefully one will be flattering of all four. When I handed the camera back, one of the foursome asked, “Can you even see her face?” She was referring to one of the group who did not want to have her picture made. “Yeah, listen to her. She understands,” one of the women said as I turned away to continue my walk. That little five-year-old is now on the patio with me—no more writing for hours—maybe days. But life is good. I have great friends, arms to embrace this little fellow, and some good beach memories. Doing my best to “seize the shining moments.” What about you?